This current series of posts is aimed at an overview of the top oil producing nations, seeking to establish how the ranking of the countries is changing from the original table that EIA put out in 2008, After looking at the conditions governing the top six, this was followed last week when I looked at the condition of the following three (Mexico, UAE and Kuwait) in a little detail, but, having spent four posts on Veneuela in the recent past forebore going back there again. It is worth recapping, however, that the initial order has changed, and that, currently Russia is at the head of the League, slightly ahead of Saudi Arabia., and both producing somewhere around 10.2 mbd. I’ll go more into that detail as the posts focus in on the individual countries later. The United States production, if one includes ethanol, is around 8.2 mbd, and this is in third place,. China has moved into fourth place, slightly ahead of Iran which is followed by Canada. At present these six appear to be the only countries producing over 3 mbd. In the next tier down I have already mentioned the United Arab Emirates, which have moved into 7th place, with a production of around 2.81 mbd, how ahead of Mexico, albeit perhaps barely (based on the addition of NGLs etc). As with the UAE Kuwait has been limiting production in line with OPEC requests, but while only producting at around 2.35 mbd at the moment, is looking to increase this to up to 3.5 mdb by 2015, which would move it into the top tier. Venezuela, although it too has some grandiose plans, based on the potential increases in production from their tar sands, is currently producing at down around 2.26 mbd. As I have mentioned Venezuela does have plans to raise production to 4 mbd by 2015. However recent commitments to China of up to 1 mbd and problems that Venezuela continues to have in meeting current obligations leaves a large question mark on those predictions. And so we come to the lower half of the second tier. In order to create the current ranking we have to first work out what the current levels of production are, and the future potential. So let’s start with Norway, since that country did rank 11th in 2008. Statoil has noted that their equity liquids production fell to 1.945 mbdoe in the fourth quarter of 2010. Statoil anticipate that there will be little change in production this year, but that there may be a slight rise thereafter. Statoil is not, however, Norway, being responsible for about 80% of the countries production (with properties abroad as well) but I mention it as indicative of the trends. One hopeful sign of which been the agreement with Russia that defines who owns what in the Barents Sea. 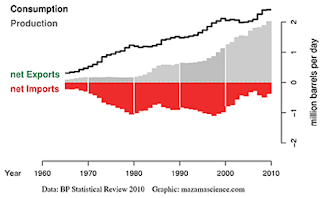 However when we look at the long-term Norwegian trend is is recognizably downwards, with the Norwegian Petroleum Directorate predicting a 1.7 mbd average production in 2011. 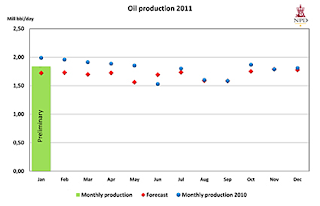 The Directorate is predicting that oil production will fall to 1.54 mbd by 2015. This does not consider other liquids and if these are included, while the overall total still lies below 2 mbd, it is currently a lot closer to that, though that is not expected to last. In January this total, was made up of 1.836 mbd of crude oil, 256 kbd of NGLs and 69 kbd of condensate. 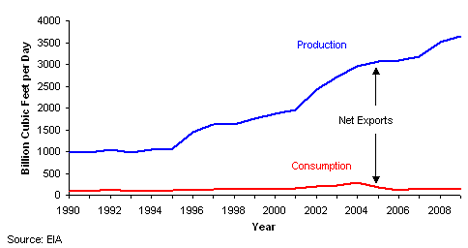 Most of Norwegian production is exported, and the percentage can be seen from the EIA Country Analysis. The relatively flat domestic production is (as we have discussed with the Export Land Model) not typical. Natural gas production, on the other hand, is continuing to rise, though it depends on finding and developing new fields, and 95% of this is exported. 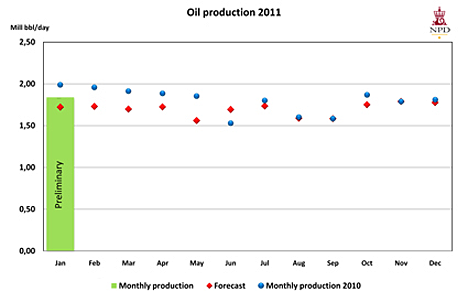 Norway produced 3.65 Tcf in 2009, with the majority of production coming from the Troll, Oman Lange and Asgard fields. The next country down the 2008 list was Brazil, and here there is a change in order since Brazil is now rising past 2.12 mbd of crude production in December, moving ahead of Norway. Offshore production in the Tupi field, which may hold 6.5 billion barrels of oil, will be followed by that from the Jupiter field, possibly of similar size. The fields fall deep offshore in the Santos and Campos Basins, which will deserve a couple of posts on their own, down the road. The Tupi field is being developed as a pilot project in two phases. In the first phase tests will be conducted to gather information about the future production systems. This phase is expected to end in 2012. The second phase is expected to start from 2012 and will include two parts. In the first part (2012-17) ten production units will be installed at the field with 20 producing wells and injectors expected to be drilled during this time. In the second part of phase two (after 2017), new technologies such as dry completion units will be employed to recover oil and natural gas from the field. 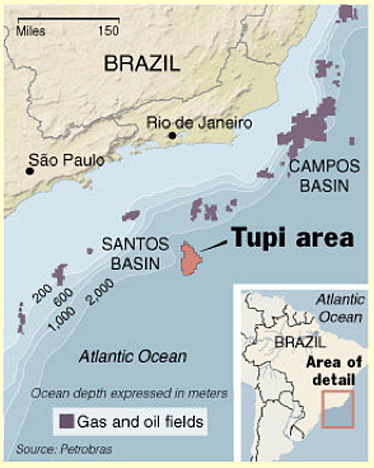 Brazil plans to double crude production from the current 2 mbd to 4 mbd by 2020, reaching 3 mbd by around 2014. However overall liquids production is already at 2.7 mbd and the EIA anticipates that this will rise over 3 mbd by next year. With the cumulative liquid totals Brazil has also passed Venezuelan production and may soon be competing with Kuwait as they both move into the top tier. Brazil also produces ethanol, mainly from sugar cane, with production at around 450 kbd However, with a growing economy, the country does not, as yet, have much of its production available for export. 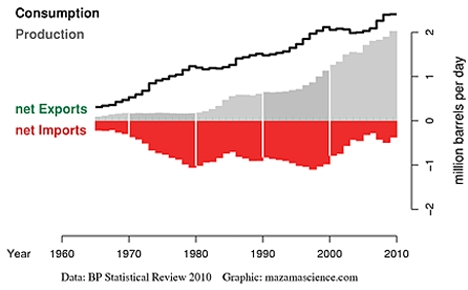 (The BP figures are a little more pessimistic than those of the EIA). Brazil continues to find oil onshore, most recently in the Amazon Basin and this bodes well for the targets that it now envisages. Brazil gets most of its electric power from hydro-electric power plants, but is able to use the natural gas that is recovered during oil production to meet about half of the national need for gas, the rest being imported. In January, OPEC reports, Iraq produced a total of 2.7 mbd, which was 300 kbd up on production in the last quarter of 2010. 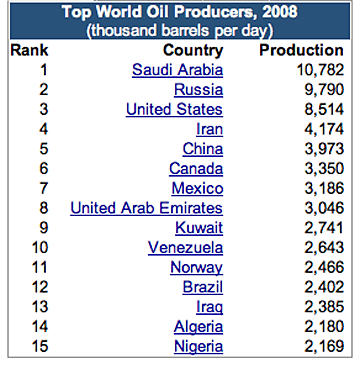 To put this in context in February 2003, just before the conflict began, Iraq was producing 2.8 mbd. At the moment production is centered on the North and South Ramalla fields and that of Kirkuk in the North. The problems of Iraq are not so much, in the short term those of most of the rest of the world, i.e. in finding more oil. In the immediate short term the information on fields that have been known for some time (and in some cases were previously producing) already exists. What is needed is some way of ensuring that the infrastructure is repaired and, if necessary, new pipelines laid. Those plans are now advancing although it is now going to be more difficult to foresee their short-term success, given the developing turmoil in the region. The EIA has posted a table showing the potential from the different regions. 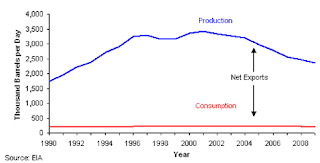 Consumption in Iraq has been fairly stable until about 2007 where it started to climb, and, given a little more stability in the country, it is reasonable to expect that it will surge as it has in much of the Middle East. On the other hand it is a little difficult for me to see production rising to the 12 mbd figures that are now discussed as being possible for Iraq by 2017. Until recently Iraq was flaring more than 60% of the natural gas that it was producing (perhaps as much as 1 bcf/day) One option that is open is to pipeline some of the gas up to Turkey and then feed it into the Nabucco pipeline. There is a hope that this can lead to exports of up to 2.5 bcf/day but new legal hurdles are continuing to delay progress. Apart from resurrecting the pipelines there is also the possibility of installing an LNG train or two. And when one is considering the growing instability of the region, the next country down the list is Algeria, and that has now started to be mentioned among the countries feeling the fallout from the initial protests in Tunisia. The Algerian Foreign Minister is denying the risk of a “domino” effect. Possibly this could be because, as it is reported the income from oil and gas sales can, in this case help. Unrest in Algeria could have implications on the world economy since it is a major oil and gas exporter, but analysts say an Egypt-style revolt is unlikely because the government can use its energy wealth to placate most grievances. There are, however, other opinions. Algeria is a member of OPEC, which reports the January 2011 production of oil at 1.28 mbd, which has been relatively stable for some time. The EIA consider that the crude is some of the finest in the world . Production is supplemented by condensate (450 kbd in 2008) and NGL (357 kbd) for a total liquid fuels production of over 2 mbd. It is the largest oil-liquids producer in the African continent. Algeria, which operates the oil and gas through the company Sonatrach exports most of its natural gas, through pipelines to Europe and through LNG terminals, with a new one that is to be completed in 2012. Total exports are around 2 TCF making it the fourth largest exporter. (CIA 2011 World Factbook). Gazprom has recently become involved in field development. It also provides a useful fuel for the processing of fertilizer in Morocco, as Jeff Vail noted, back in 2008. 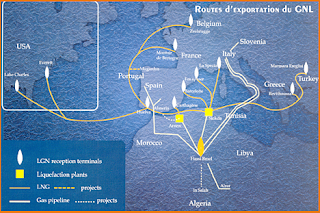 As one of the world’s largest exporters of natural gas, Algeria supplies Southern Europe. • 67% of oil and gas reserves contained in the Oued Mya and HassiMessaoud areas, where the two giant fields Of Hassi Rmel (Gas) and Hassi Messaoud (Oil) are located. Then come the basins of Rhourd Nouss (9%), Ahnet Timimoun (4%), and the Berkine basin. Algeria is hoping to increase exports by 50% by 2015, using a new pipeline into Spain to help develop the European market. But the current turmoil may make some of these plans moot. Directional / Horizontal Drilling Since 1920 directional drilling in Oklahoma is an integral part of its oil industry. Because oil drilling technology has improved over the years, drilling wells in. for our verification and proceedings without delay.